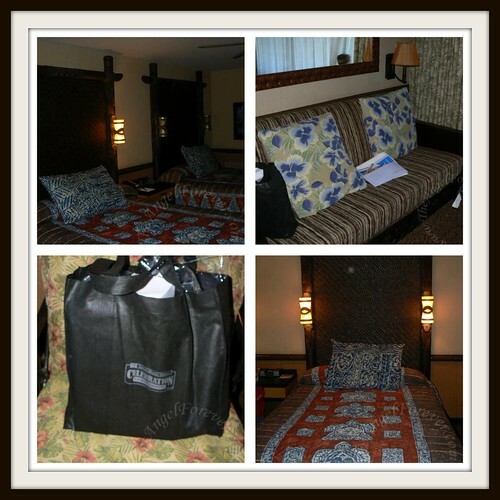 After a morning full of fun and adventures, we finally checked into the Polynesian at about 4:00. From there, we quickly went to the hospitality sweet where I literally bumped into Amanda Tinney from Disney Every Day. This is where we were given a large bag filled with goodies for the entire family, credentials, agenda for the Disney Social Media Moms Celebration and park passes. Then we rushed to drop things off at our room and change a diaper. As you can see, the rooms at the Polynesian are huge! The decor is amazing and works perfectly with the theme. There was no need to crowd in the room and stuff the double stroller from Orlando Stroller Rentals into the corner. We were now able to leave the stroller by the sliding glass door where the balcony was with the pretty garden view. For a fabulous walking tour of the room at the Polynesian head on over to see Carolyn’s vlog tour – I love it! With time ticking, we quickly packed the boys back up and were off to meet Christina (@CutestKidEver) and her family to go to ESPN for the first official event. The chartered buses to the event were fabulous. We did not have to fold up the stroller. The cast members helped us to put it right under the bus and it was waiting for us when we stepped off and at our new destination. At first, we tried to stuff into a bus that was filled. The nice part was I was able to quickly meet and say hello to Monica Brady of Mommy Brain Reports (@MommyBrain). Wish I had had more time to chat, but the bus was filled and we had to move. 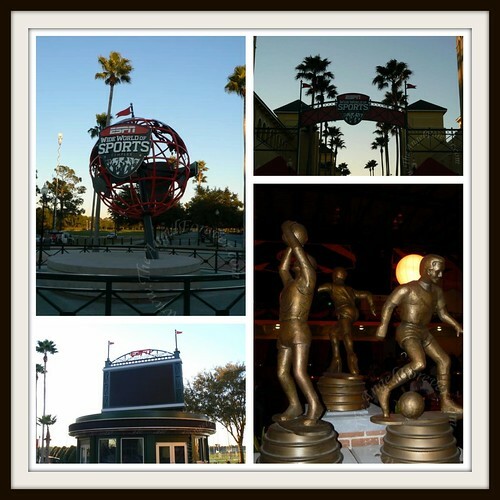 When we arrived at ESPN, we walked in the cold to our destinations. 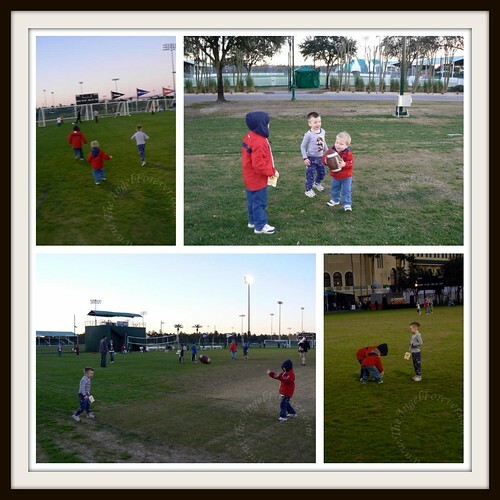 Christina and I went to the press conference while the five boys went to play out on the fields. Thanks to coming a little late, we walked into the session as they were finishing up the talk about the new plans for Fantasyland. As a long time Disney World visitor, it is hard to imagine such change. Of course, all of that went out the window when they explained how the new Dumbo ride would work. Rather than just have one set of Flying Dumbos for everyone to enjoy, there will eventually be two. The new waiting areas will be intereactive. No more waiting on boring lines, families will be able to participate in carnival games as they wait to fly with Dumbo. Once again, Disney shows that they understand how to get guests to wait patiently for a ride while keeping them busy. Please let me know if you have another post you would like me to add here. Once the press conference was over, Christina and I followed the crowd over to where the Tailgate style dinner/party was taking place. 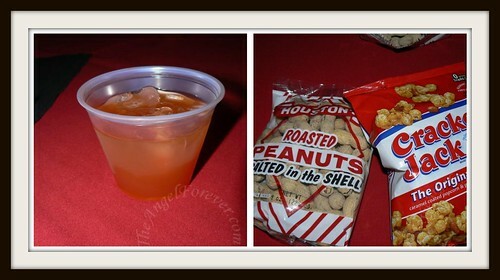 We grabbed a drink and went to the tables where peanuts and Cracker Jacks were on each of the table. After a while, the boys met up with us and we had some dinner and met a few characters along the way. There was music playing, activities on stage for the older kids and tons of people. Eventually, we spotted desserts. 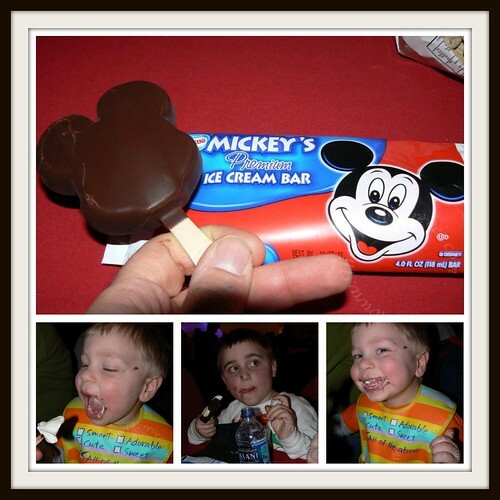 The Mickey ice cream bars were too much for us to say no to. The boys certainly enjoyed their treats. We decided that the boys were getting really tired and packed our items up to head back. 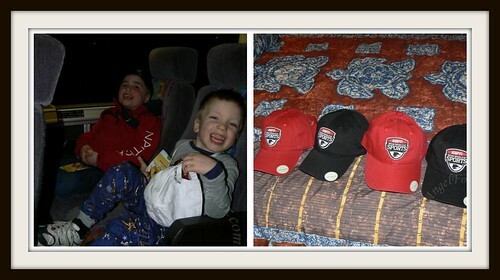 On the way out, we were given ESPN hats and then boarded the buses back to the Polynesian. During that ride, we also met up with @MorethanMommy (she writes at Quirky Fusion and More Than Mommy). We had been Tweeting with her while planning the Disney trip since she was also staying at Pop Century the night before moving to the Polynesian. Loved chatting with her and hope to do so again soon. As we left the bus, we were able to see the Wishes fireworks from the Magic Kingdom over the Lagoon at the Polynesian. We went back to the room to settle the boys. The next morning, I had to be at the bus by 7:30 to be to Epcot for a busy morning. 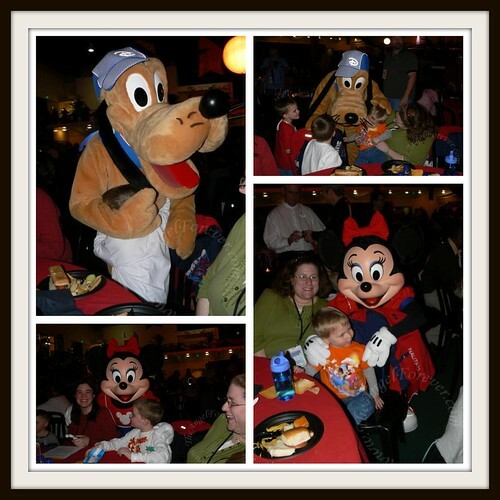 Disclosure: Although we paid for our own trip to Disney World, we were given an incredible deal thanks to Disney. The $350 conference fee included 3 nights at the Polynesian, several meals for the entire family, 7 day park hoppers for everyone, conference/meals for me and some other items to take home. .-= Nicolle B.´s last blog ..Enter to WIN a $100,000 College Scholarship Fund with Next Direct =-. All these posts make me want to go back. I’d relive the entire week over and over again. Your recap was nice I came at the end of the presentation since our flight came in late. The cruise sounds amazing! I’ve been avoiding your blog because I’m so jealous! ;) Looks like you had a great time. We are headed to Disney this weekend because my husband has to be in Orlando anyway for work. But it still would’ve been awesome to go to the conference. Glad you could go! .-= Holly at Tropic of Mom´s last blog ..Love is still in the air =-. .-= Shannon (The Mommy-Files)´s last blog ..Aloha Friday #40 =-.